The LOST and Movie tour gives unique insight into the filming locations of LOST, famous Movies and Hawaii Five-0. The main focus of all tours is LOST. We offer 3 tours that explore different parts of Oahu and the filming locations associated with them. Tours include the North Shore, South Shore, and Circle Island Tours. The North Shore Tour focuses on LOST beaches and the Dharma Village. The South Shore Tour is a well rounded tour offering LOST and Movie locations where the very best in Oahu scenic beauty abound and is especially good for photography. The Circle Island Tour is our best value, for those with an entire day to devote to LOST & Movie touring and combines the best locations of North and South Shore Tours, plus the beautiful Byodo Temple and culturally significant Waimea Valley and waterfall. Tours are always small group and often private tours, conducted in our new "Dharma Van" a 2017 Mercedes Metris or Hummer H2's with professional guides. South Shore Movies - A half day tour with Elvis in Blue Hawaii, John Wayne in Big Jim McClain and In Harm's Way, 50 First Dates, Pirates of the Caribbean, Journey 2, Tora, Tora, Tora, Jurassic World and KONG. Includes LOST, Hawaii Five-0 and Magnum PI. This tour is heavily LOST focused, but is the most well rounded tour with regards to inclusion of movies, Hawaii Five-0 and the most magnificent scenic overlooks that a person can see without conducting a difficult hike. Morning tours are usually more relaxed due to better weather and less traffic on the roads and at beaches. North Shore Movies - A half day tour with 50 First Dates, Elvis - Paradise Hawaiian Style, Tora, Tora, Tora, Pearl Harbor, Jurassic World, KONG, Jumanji. This tour is heavily LOST focused with the Crash Site Beach, Survivors Tent Camp Beach, Dharma Village and much more. See about 2/3 of the island in one five hour tour. Morning tours are usually more relaxed due to better weather and less traffic on the roads and at beaches. Circle Island Movies - All movies listed for South and North Shore and is heavily LOST focused. See almost the entire island in one long day as well as your favorite LOST and Movie Locations. All tours are like two in one, wonderful tours for seeing the island with numerous stops for views of our magnificent scenery and all those LOST and Movie filming locations, all on one tour. The Circle Island Tour is a nice combination of the North and South Shore Tours, but does not include the downtown area or Pali Lookout. It includes entry to the Byodo-In Temple and Waimea Valley and Waterfall, a historically and culturally significant area of the island, where some important LOST scenes were filmed. All tours are heavily LOST focused and include numerous stops to actually walk the ground where your favorite episodes of LOST were filmed. All tours are unique and can be customized due to the small group size of each tour. The South Shore Tour has exceptional scenic beauty and includes downtown historic sites and is our only tour covering the Pali Lookout and downtown area. It is a blend of more Movie locations plus LOST and Hawaii Five-0. The North Shore Tour is primarily LOST with Movie and Hawaii Five-0 locations. 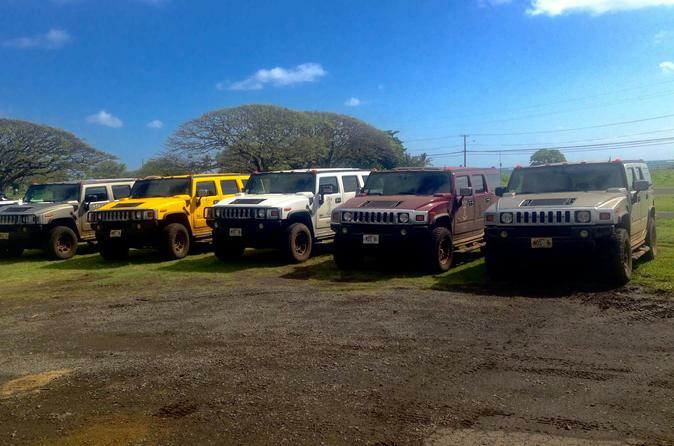 We are the only Hummer Tour Company on Oahu and tours are conducted in either Hummers or our new "Dharma Van" a new Mercedes Van with Dharma logos all around. All our tours are very small group or private tours and we customize each tour to meet our guests specific interests. Please feel free to contact us and tell us your main interests so we can customize your tour. Mahalo and looking forward to helping you to Get LOST on Oahu!